Ryker Jacob Erickson came into this world a fighter. He was born premature, at 34 weeks, with a chromosomal disorder, which caused him to have mental and physical challenges. His parents were told that Ryker would be blind and deaf and not survive to see his first birthday. Ryker, however, had other plans. He far exceeded his life expectancy, learning to roll, sit, crawl, and pull himself up. Through his therapies and schooling, he explored art, play, and physical control. He fought to learn and grow every day in his short three years with us. Ryker loved to be outdoors. Go on walks, go to the park, go on car rides. He loved to be on the go, to go fast. He loved wheels, flashing lights, and music. His mom added a little magic to his life by encouraging him to jump and dance, to enjoy movement by holding his hands for support. His dad gave him new perspectives by riding Ryker around on his shoulders, always serving as Ryker’s rock. His sisters taught him love through their endless kisses and sweet embraces. He shared all of these loves and experiences with his twin brother, Krew. Their connection was obvious. Ryker was a little more advanced than his twin which inspired Krew to follow his lead. Ryker’s influence on his family was eternal. The lessons learned from him and memories created with him will always be cherished. Ryker will be missed by his mother, father, sisters, brother, and countless additional family and friends. We miss our sweet, blue-eyed boy but know that he is perfect in Heaven. It will be a joyous day when our family can be together again. Funeral services will be held on Saturday, May 20, 2017, at 10:00 am, at The Church of Jesus Christ of Latter-day Saints Chapel, 1911 N. 24th Street, Mesa, AZ 85213. The viewing will be held prior to the services at 9:00 am. Sorry for your loss. Life is so precious. My prayers are with you. Sorry to hear of your loss of your precious Riker. Cherish your memories. God Bless you All. Thinking of you Grandma Jo Ann. We love you all and are so sorry for your loss. Sending love and prayers to the Erickson Family. Our deepest sympathy, love, and prayers to your family from all of the Johnsons. Our deepest sympathy,prays and thoughts to all the Erickson family. We love you all and are so sorry to hear about Ryker’s death. What an absolutely, beautiful child with a look of wisdom far beyond his years. I am so sorry for your loss of this darling boy. I am so sorry for your loss. My prayers and thoughts are with you and your family at this difficult time. Sending love your way. Our hearts and prayers are with you all. What a beautiful little boy. Had the pleasure of having the twins in our home last year. Melanie and Jake have huge hearts taking in these boys. Ryker is now in heaven! He will be watching over the family!! Thoughts and prayers are always headed your way. You are being lifted up in prayer. We pray for strength during this time. Much love to you and the whole family. Our love and prayers go out to your whole family. Richard and JoAnn Erickson have shown us great love and respect for life. I can see as grandparents the training that went into such great parents for Ryker to spend a few years (too few years) on this earth learning of God’s great love. Sending our prayers and deepest sympathy for the Erickson Family. Our prayers are with your family for strength and peace . The Lord’s blessings and spirit be upon each of you. 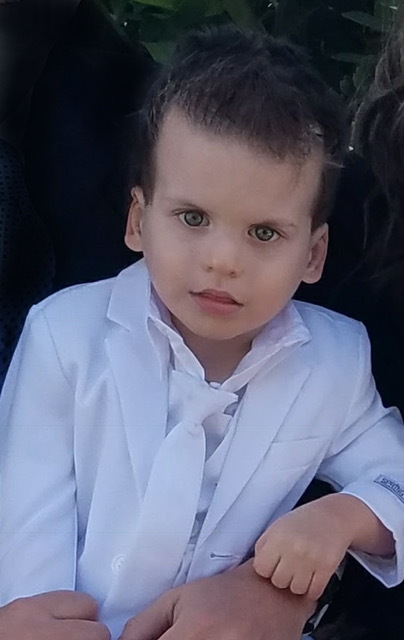 Ryker is a pure valiant spirit who touched many hearts with just a short time here. May your knowledge of our Savior’s love and eternal families carry you through your difficult days ahead of you. Our thoughts and prayers are with all of you. Ryker will be in good hands and is along with many angels. Our hearts are with you in this time of sadness, but rejoice for he is home and you will see him again. We are thinking about you and sending love. We love you and pray that solace has found you. You have a huge community of friends and family to lean on. We’re all here for you. What a beautiful boy. Wishing you love and support in this difficult time.